We recently held our first ever annual awards evening. Easily one of the best night’s of the year. The real difficulty was deciding the awards from such an impressive and talented group of people. The instructors put their heads together and after long and serious deliberation period managed to come up with some winners. We are proud to announce that our Role Model of 2015 goes to Chris Corner. Chris’s effort over 2015 has been unwavering, when on the pitch (which she often is) she will try and try and try to near self destruction for both herself and her team. But she never ever complains, pushing herself whilst being supportive of others and is always positive. She came to her first Rabble 18 months ago, where we remember her for being quiet and shy but with a fierce commitment. It has been a delight to watch her grow in confidence and fitness over this period and she is a central member of the community, barely missing any sessions or socials, no matter how late the night out or what the current state of dress is (Chris also won Most Ridiculous outfit for 2015 following a Finsbury Park double in a ball gown)! With a day job dedicated to caring for others she may have a gentle nature, be very small and have earned the nickname Biebs (after Justin Bieber for looking 12) but she never gives up no matter what the hurdles, her mental strength is a force to be reckoned with and this makes her a great example to others. Chris is a thoroughly deserving winner of Rabble Role Model 2015. I first found out about Rabble in mid-May 2014 while looking for new exercise groups and ways to meet people in London. I’m a Londoner born and raised, but I had recently started my first job as a support worker caring for adults with learning disabilities after returning from university, and the often changing shift work meant it was difficult to meet people. Rabble, with its flexibility, gave me a great opportunity to do just that. And I love running! I instantly fell in love with the fun attitude of everyone there. I felt so welcomed by Charlotte and Rosemary (the only two fabulous instructors at the time!). There was such a relaxed style to the games and it was so much more fun to be having a laugh playing team games with others than it had been trying to work out in the gym or at home by myself. 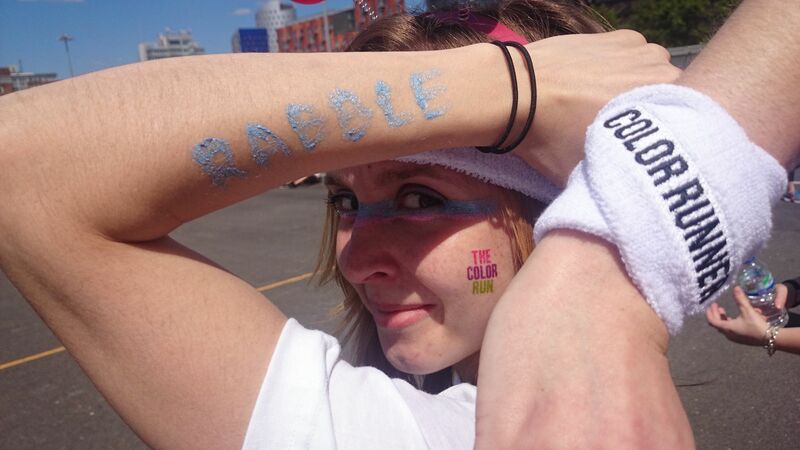 Rabble has become such an important part of my life. I was honoured to win Rabble Role Model of the month in February, and quickly found myself with a bunch of new friends as Rabble grew and the Rabble Social Club was born. I simply cannot count all of the amazing nights out, parties, circus trips, lunches and birthday parties I’ve shared with all my fellow Rabblers, as there are just too many, but suffice to say there is always something going on and I always have such a great time with these wonderful people! I have grown in strength and confidence at Rabble, which for me, coming from major spinal surgeries in my teenage years, is something I am so proud of and thankful to Rabble for. I have found myself achieving amazing fitness goals I could not have dreamed of even only a few years ago! Among them, introducing the Triple and nearly getting my 5K time down to 20 minutes! Rabblers are fantastic at helping keep me motivated (because I’m suuuper competitive :)), and I have continued coming to Rabble because it is unlike anything else I have ever tried in terms of exercise classes. It works.